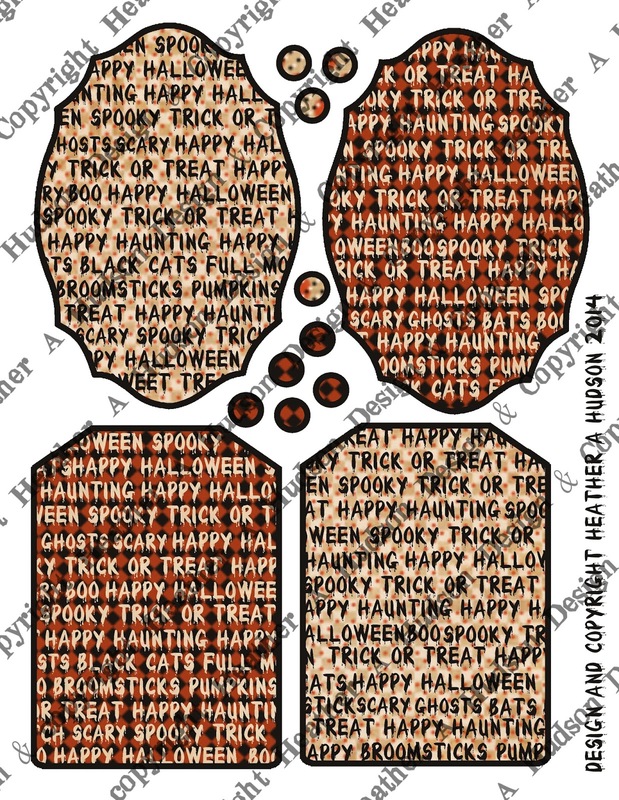 Today I would like to share with you a Halloween tag that I made using some of my digital collage sheets and a few office supplies. I used a couple black paper clips and a #5 shipping tag. Close up of ticket at the bottom. All of my Ribbon and Trims came from Really Reasonable Ribbon and Glitter from Art Glitter. Here is a look at the tiny tag that comes out. Gloria's Craft Hoarders Challenge: Use a School or Office Supply. 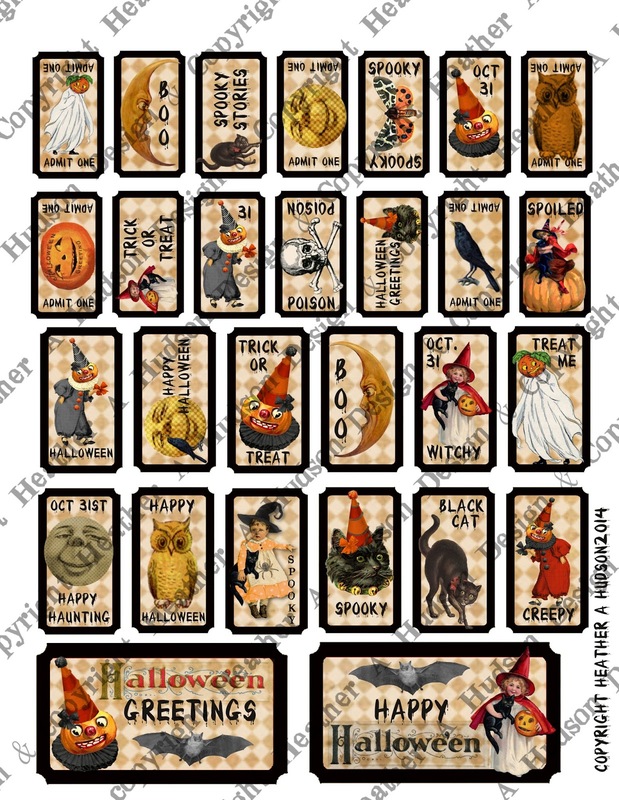 The theme this time is Halloween. Please visit the link above for the deets and rules. 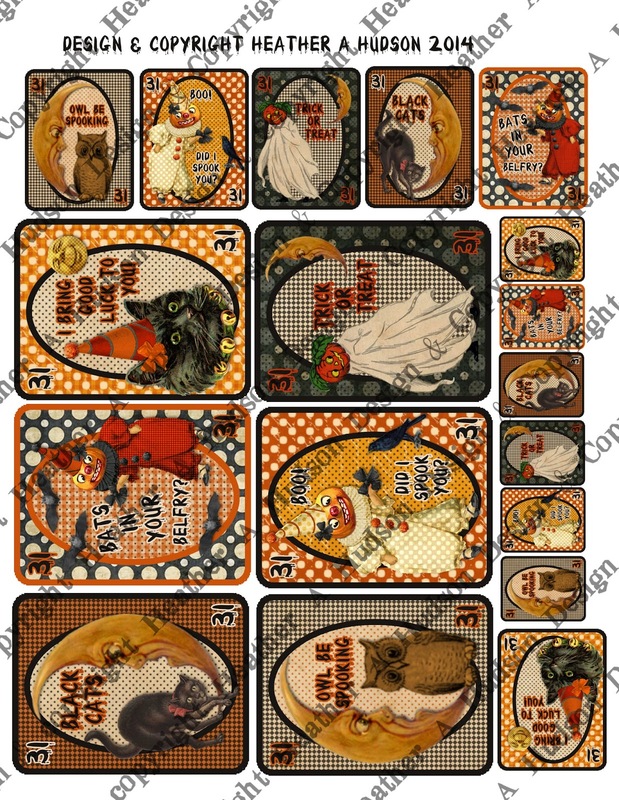 I had a little time to play the other day and I came up with a new Halloween Playing Cards Digital Collage Sheet. 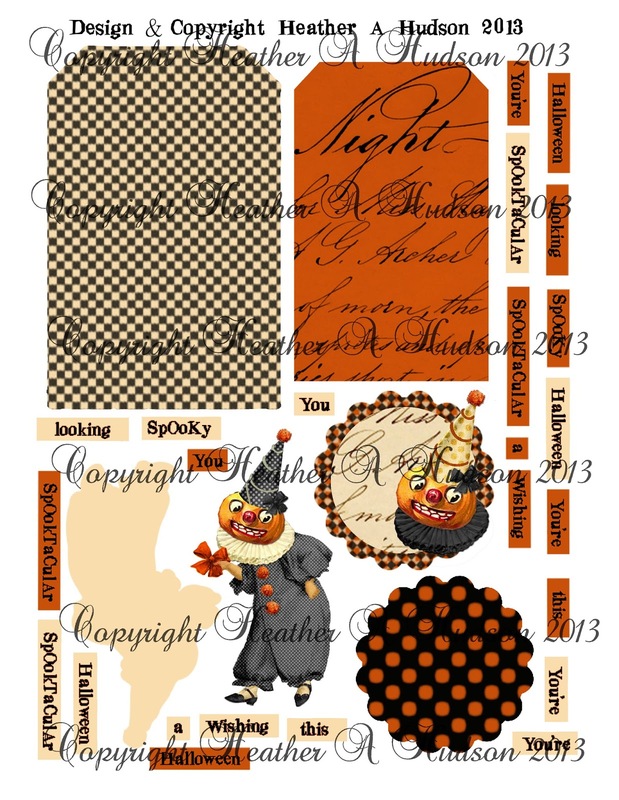 Halloween Tickets Digital Collage Sheet. where I am now hosting my challenges. 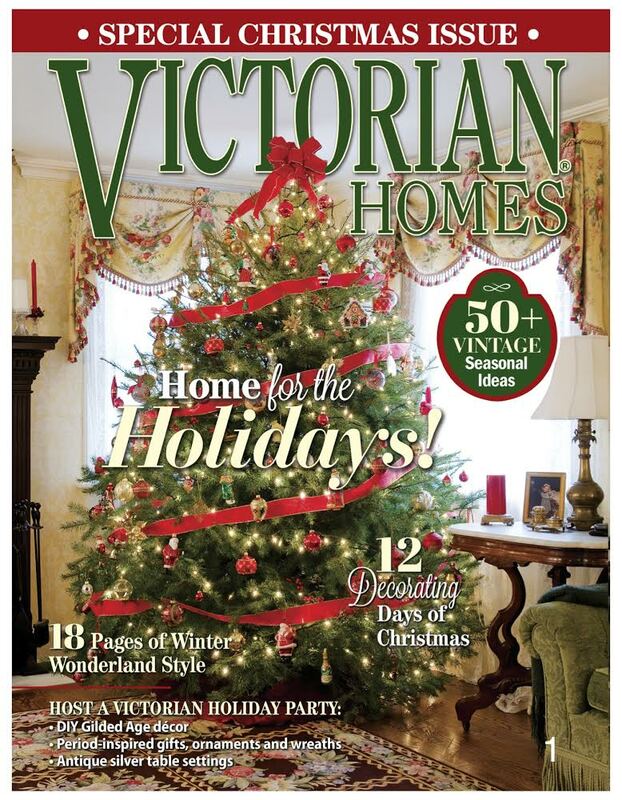 So if you have some time, hop on over and see the inspiration from my Design Team and Guest Designers. 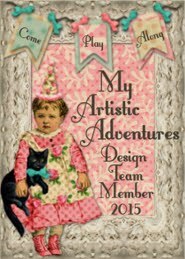 9th My Artistic Adventure Challenge! So you can find all the details and rules for the challenge here. 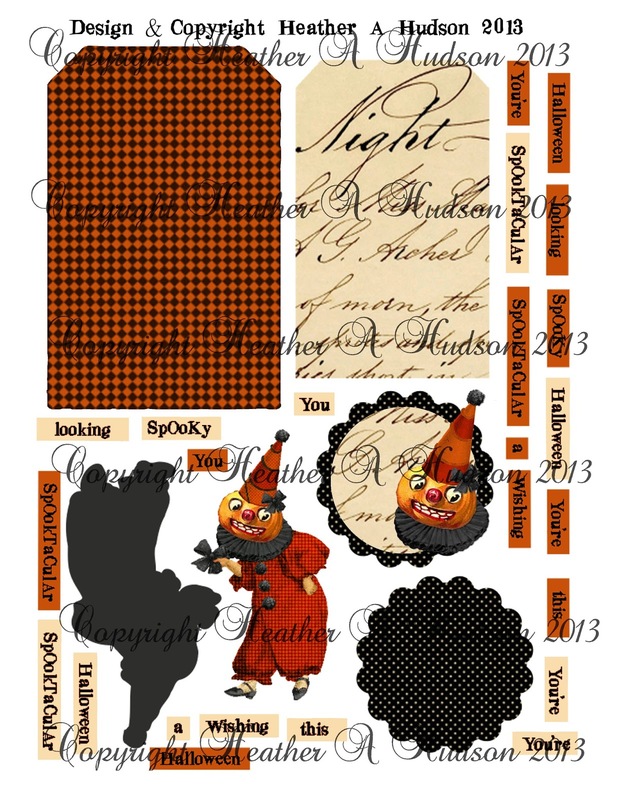 Here is my newest Halloween Digital Collage sheet. So hop on over to my new challenge blog to see what the Design Team and Guest Designers came up with last minute as inspiration for my challenge! I can't wait to see what you link up to the challenge! 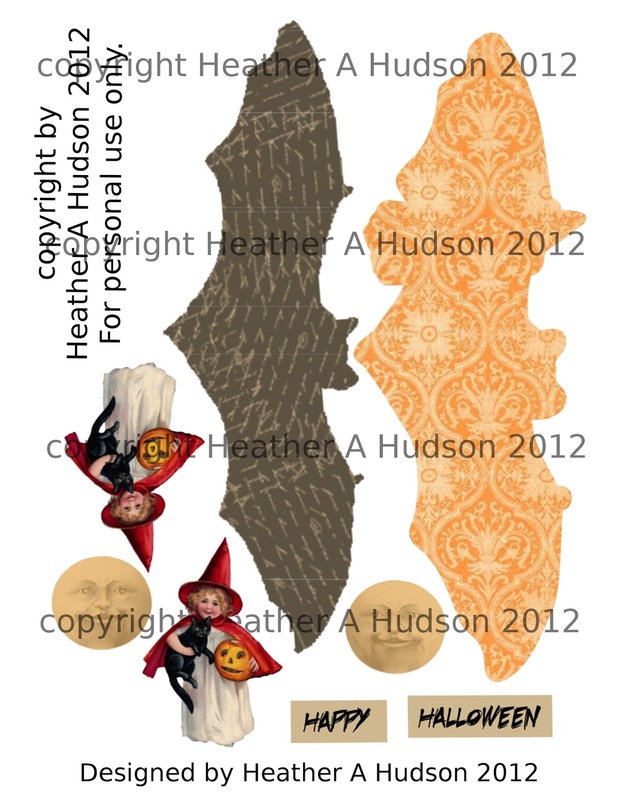 Here are a few other Halloween digital collage sheets that I have available in my Etsy. You can get all the deets in my blog post here. I hope that you can find some time to play along!! My Summer Vacation from Crafting is over!! It is time for a new challenge at Really Reasonable Ribbon. Our challenge this time is Sports and Ribbon. I have spent my whole summer carting my two kiddos to Tennis practice and matches, so I thought I would do a tennis theme. I know this is more "cutesy" than my normal stuff, but I thought the girl was kind of cute...and she had a tennis racket..so there you go...lol. I found the original image at the Graphics Fairy here. standard size 5 by 7 card base. Here is a tutorial of how I put my card together. Cut out all of your pieces and ink the edges with Ranger's Frayed Burlap. 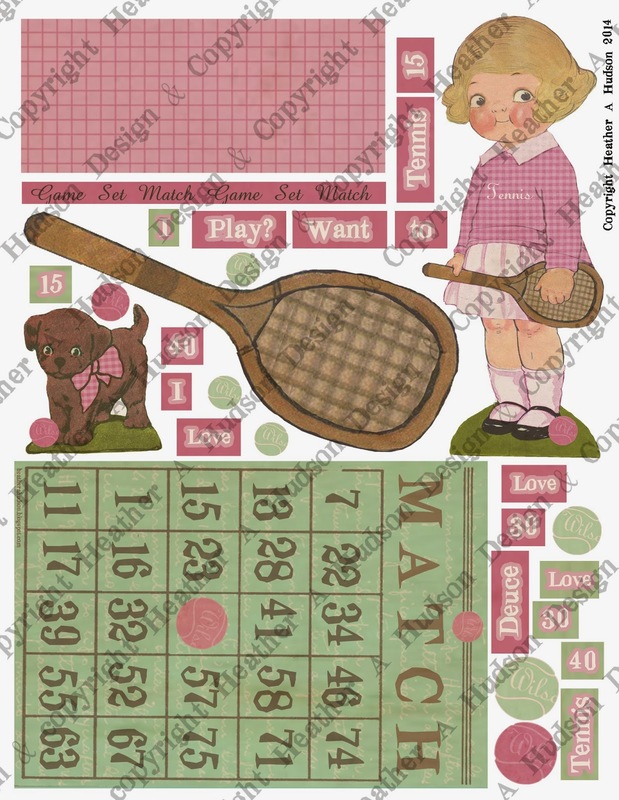 I used my Perfect layers ruler and mat with a craft knife to cut out 1/16th mat for my Bingo Image. I used Scor Tape and Tombow Foam Tabs from Really Reasonable Ribbon to adhere my layers and images to my card. Please refer to photo below for placement. I used my favorite Juliet Lace from RRR tucked in behind the top of my tennis net. I glued my "game set match" piece onto the top of my net. I used my crop o dile to punch two 1/8 inch holes in her shirt and used a piece of Rose Seam Binding and Cotton Candy Baker's Twine to create a cute little sash at her waist. I put all my pieces in place and decided to add a couple Tombow Foam Tabs to the back of my pooch. 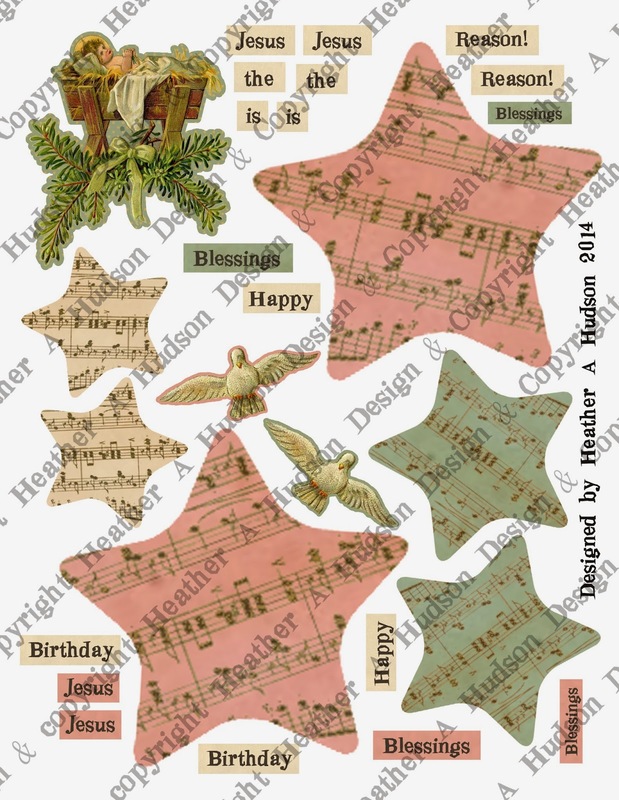 I finished adding all my images to the front and decided to add some embellishments. I used both Deep Ivory and Pink Mulberry Roses and Moss green leaves from Really Reasonable Ribbon! The card looks pretty cute as it is, but I decided to finish it off with some Art Glitter. I used my favorite colors, Cheeky pink, Martha's Yard, Chamois, and Fauna as well as the Designer Dries Clear Glue and Fine tip applicator. Well you may of noticed that the color of my card looks a little different at the Really Reasonable Ribbon blog. It looks like the photo below. Look how green the bingo image is...."YIKES!!" That was how all of my photos were showing up once they were uploaded to blogger...drove me nuts! So I took a little time to figure it out, nothing is worse than creating something cute and when you upload the photo to a program...the colors are off! So I tried a couple things to fix it and then found out is was an easy fix...lol. So if you are having some issues with your colors being off (it doesn't always happen, seems certain colors for me) well I will be doing a 30 second tutorial on how to fix it...lol! BOLB (Bestest Online Buddy) Carol! Carol and I have become very close online friends. I know I can count on her to try out the collage sheets that I design and come up with wonderful creations! I am so glad that she is part of my design team. Carol always seems to find the time to create wonderful things for her friends and family! I know I can always visit her blog and find wonderful inspiration!! I am supposed to answer a few questions about myself, so here it goes. Well, I have taken the summer off from paper crafting. I picked up a few pieces of furniture that I plan on painting. I started painting a couple of the pieces. 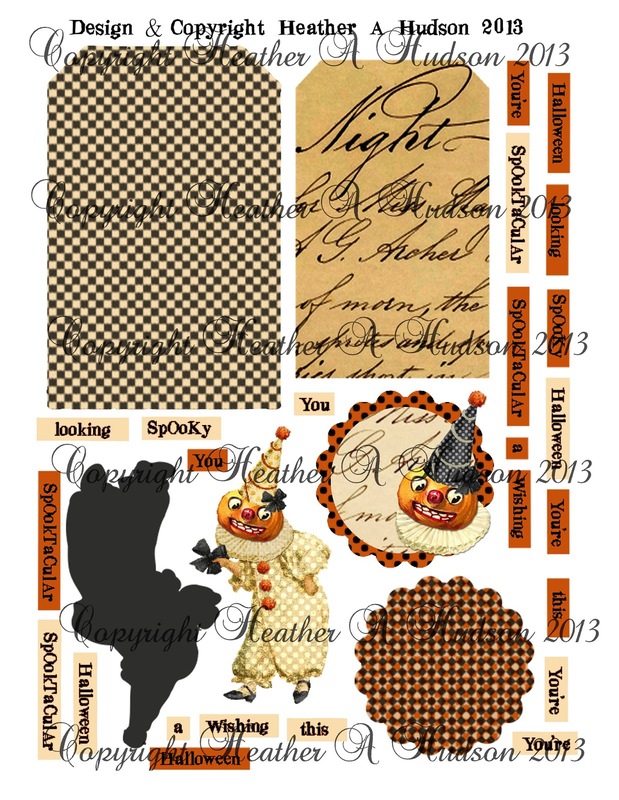 I do have one collage sheet that I recently put together. I would have to say that I love the Victorian/Vintage and even Primitive Styles. Mixed with Shabby Chic. All of my painting, paper crafting, digital work and decorating all fall into these categories. Here are a couple new tole trays that I have added to my collection. I have decided to continue my collection in my kitchen. The large Green one at the top is my favorite. I am hoping to use it as an inspiration piece to paint one similar myself. Here is a look at an antique painting that I purchased and placed in one of my many empty frames. I was so happy that it fit! Now I just need to make a new hanger for it. Well, kind of anyways. I am on a couple of design teams and usually am creating for a challenge we will be having. So I will ponder in my head a couple of ideas of what I would like to do, and normally the night before my piece is do...I will whip up my creation...lol. I have done a few things in advance, but it so hard to not share right away what I have worked on...lol. I love to find inspiration in things that I have around my home, my mom's home and from things that my friends create. 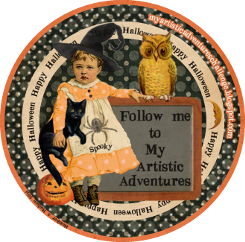 So I would love it if you would stop by their blogs and see the things my friends do to inspire me. Sandi was the first person to give me my chance to become part of a design team. She has all kinds of wonderful things that she plays with and she inspires me all the time to try new things. She also has a wonderful collection of old images that she has allowed to me to play digitally play with. Leanne is the owner of Gecko Galz, and has provided me with tons of images to play with :0) Her's was the first DT that I actually tried out for and made :0) She even has freebies on her blog that you too can play with! I hope you have all enjoyed your summer! I took a break from crafting only to hang out with my kiddos on Boy Scout Campouts and assisting with the Boy's Tennis teams (I LOVE to watch the boys practice, take them treats. I love that the boys all know if they need a ride home they can ask). My boys are at the age (teenagers) where they are fun to be around...so I have been spending all of my time with them. School started for the kiddos today! (Youngest to the left and oldest in the Middle..and a neighbor to the right). It was super dark this am. Both of my boys are playing Tennis. My oldest will be playing on Varsity this year and my youngest on JV. My youngest has his first Tennis Match this evening!! I am so excited! (I am praying he can keep the ball on the court...or in the fenced in area...lol). We went to Mackinac Island with the Scouts a couple weekends ago. I have had so much fun with the Scouts this summer! Here are two of my Volunteer Peeps with me. Here are some photos from a Camp out in July. Here is Despina one of my bestie friends...pretending to cook Tofu Sramble :0) All the Old Goats and Parents decided to be Vegan this campout! Here is Despina's son with my youngest...relaxing! My oldest hanging out in a tree :0) (on the right). We were super lucky that My Grandparents came for a visit! The boys got to spend some quality time with their Great Grandparents! On another note...I will be getting back into crafting soon! I have decided to play along with Claudine's altered playing card challenge!! Of course I Decided this last night around 11pm...stayed up till 2am to get all 52 of my cards prepped with gesso! I guess some things never change...I will always be a last minute artist! I would love to know how you spent your summer! !